Here are this week’s new releases and top downloads for the PlayStation Video Store are in! A new channel has launched this week: DC Comics, where you can catch your favorite DC Comics super heroes. Download the epic adventures of Batman, Superman and many more action-packed good-battling-evil episodes today under TV Shows –> Networks –> DC Comics! As for this week’s top movie downloads, Outlander is in first place followed by The Uninvited and Paul Blart: Mall Cop in second and third place, respectively. Check out whats new below. The last PlayStation Store update for May 2009 is now live. Europe has received a massive update with two new downloadable games and two new demos. 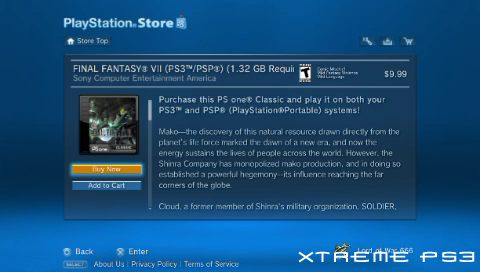 As for the US, there is one new demo and a PSOne classic available for download. Both stores have received a lot of new game add-on content, including LittleBigPlanet costumes, another MotorStorm Pacific Rift Livery Pack, Saints Row 2 game pack and new tracks for Rock Band and Guitar Hero. Check out the complete list below. This weeks new releases and top downloads for the US PlayStation Video Store are now live. You can check out the new movies and TV releases below. “Terminator” is a big part of this weeks update – you’ll find all three released Terminator movies, Terminator: The Sarah Connor Chronicles TV series, and Terminator Salvation: The Machinima Series, plus your favorites from Arnold Schwarzenegger and Christian Bale. This week on the PlayStation Store, there are lots of new playable demos and a whole bunch of new game add-on content available for download. The inFamous demo can is available from both stores and the Killzone 2 4D interactive demo is finally available on the European store. There is new game add-on content for MotorStorm, FEAR 2, LittleBigPlanet, Rock Band, Guitar Hero and more. Check out the complete list below. This week on the PlayStation Video Store you will find 5 new HD movies, 11 new HD TV shows, and lots of SD TV and movies. New HD Movies include The Spirit and Afro Samurai Resurrection. See below for the complete list of new content. As for last weeks top downloaded content, The Day the Earth Stood Still was the most downloaded movie, followed by Bolt in second place and Yes Man in third. This week there are a lot of new downloadable games available to purchase on the PlayStation Store. Europe has four new games, while the US has two – the common ones are Zen Pinball and Texas Cheat’em. You can try out Zen Pinball by downloading the free demo from either store. As for new game add-on content, this week you will find content for MotorStorm: Pacific Rift, Pain, Guitar Hero, Rock Band, Dynasty Warriors and more. Check out the complete list of new content for both stores below. The US PlayStation Store has been updated with new video content, just in time for the weekend. Five new HD movies are available purchase as well as lots of new TV episodes and SD movies (details below). As for last week’s top 10 downloaded movies, Bride Wars came first place followed by Yes Man in second and The Wrestler in third place.